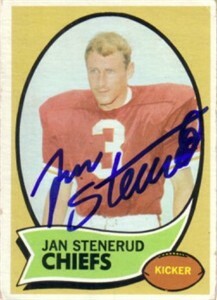 1970 Topps card #25 autographed in blue marker by Kansas City Chiefs Hall of Fame placekicker Jan Stenerud. Card is in Fair/Good condition (crease, slightly rounded corners). Obtained in person at celebrity golf tournament, with certificate of authenticity from AutographsForSale.com. ONLY ONE AVAILABLE FOR SALE.